President Museveni who is also Commander-in-Chief of the armed forces has advised soldiers to always put their country first in all that they do. 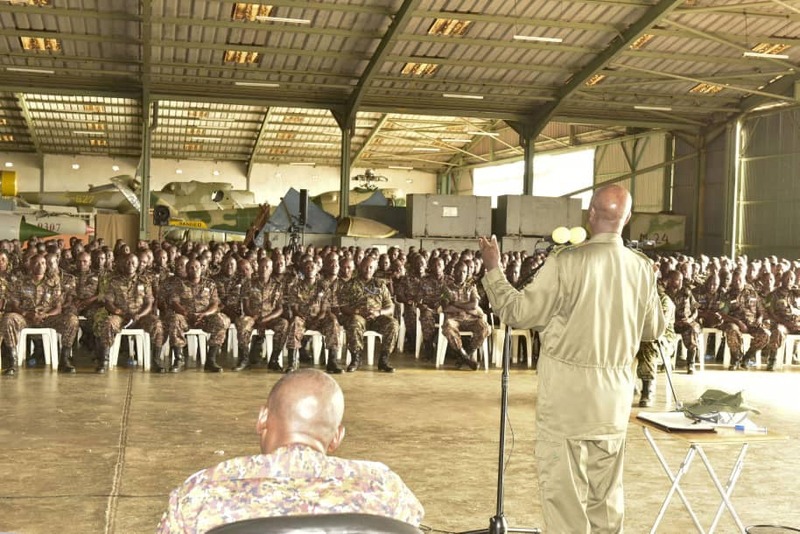 Museveni made the remarks on Saturday as he toured the Uganda People’s Defense Air Force (UPDAF) air base at Entebbe. He asked the army officers to learn, understand and apply the principles of the National Resistance Army wherever they are deployed bearing in mind their army is a liberation force that is committed to serving the interests of Uganda. He reiterated the importance of always focusing on the interest of the country in order to cement further the foundation of bringing about prosperity as opposed to identity along tribal chauvinism and feudalism as had been the case in nascent years of Uganda’s independence. “Identity has got value but it should never eclipse the interests of people. Banyankole cannot buy milk and bananas from each other because they already have them. What they need now is money to build their houses and take their children to school. They can only do this through selling to other Ugandans. We, therefore, found out in our student movement that Uganda was more important than Ankole,” he said. He noted that as officers engaged in serving the country in the security sector, just like every other adult in the country, they must be able to engage in the production of goods and services to serve society and create wealth for themselves. According to Museveni, they ought to embrace the principles of patriotism and Pan-Africanism adding that the prosperity of Africa as a whole lies in the love of one’s country and the continent as well as working for unity. 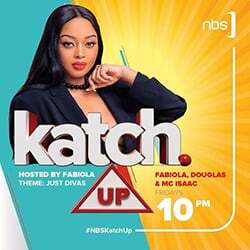 He reminded them of the socio-economic transformation the country is undergoing before asking every Ugandans to wake up and abandon the old ways of doing things but move with the trend. “You can now see that the social media is more used than radios and televisions. Very soon, this old media will phase out because people read the news online and they no longer see the need for newspapers. When you lag behind in science and technology, you disappear,” he remarked. He told the air force soldiers that socio-economic transformation was possible through education partly operationalized by the NRM government that he leads. The meeting was also attended, among others, by the CDF, Gen. David Muhoozi, Commander Air Forces, Maj. Gen. Charles Lutaaya, Deputy Commander Air Forces, Maj. Gen. Gavas Mugyenyi, Commander Engineering Brigde, Maj. Gen. Timothy Sabiiti Mutebile, Chief of Medical Services, Maj. Gen. Dr. Musinguzi, Chief Political Commissar, Brig. Henry Matsiko, Deputy CMI, Brig. Rusoke plus other senior and junior UPDF officers. 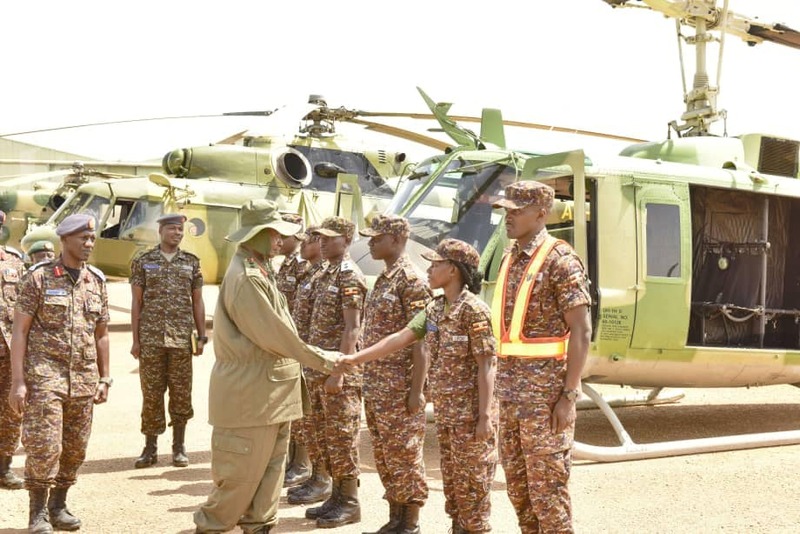 The visit to the air wing of the Ugandan army followed one at the First Division army headquarters in Kakiri on Friday by Museveni as he does his first ever countrywide tour of UPDF barracks.